Collectors of relics from American history, especially those interested in American militaria, may find a unique collecting opportunity in the accoutrements associated with the U.S. Cavalry. The scope of collecting in this field is large and can include flags, headgear, uniforms, firearms and sabers. The Cavalry is synonymous with the horse, and just collecting saddle-related items is a large category of interest in itself. The Indian Wars era (1866-1898) was the high point in the history of the U.S. Cavalry, and collectors compete enthusiastically for items from that period. The U.S. military suppliers were obviously required make items that we commonly associate with the Cavalry, such as saddles, stirrups and bits. 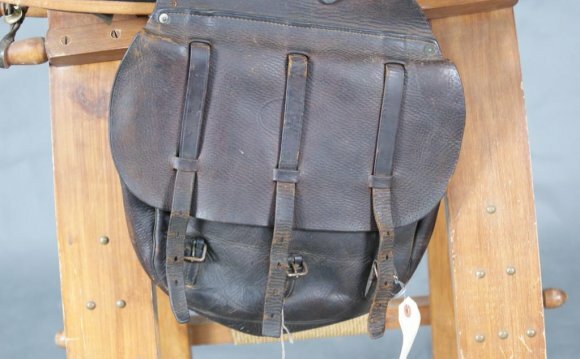 However, the suppliers also needed to make peripheral items, to be used during the campaigns, which attached to the saddles. Even today, many of these items are available in the market for collectors who are seeking them. Indeed, when one looks at a historic military saddle on display in a museum, one may at first be bewildered by all of the articles that go with the saddle; there seems to be an excess of arcane objects hanging from it. For a collector with a modest budget, these “peripheral” items allow him to accumulate separate objects that can be used to create a complete “rig, ” just the way the saddle would have looked while in use more than 100 years ago. Attached to the sides of the saddles would be conveyance items such as saddle bags for carrying provisions, saddle holsters, saddle scabbards, and carbine boots. A collector should look for the “U.S.” stamping on the leather that is proof that the item was U.S. military issue. Other more esoteric items include picket pins, tent covers, rain jackets, canteens and even lariats. Some of these may not have the “U.S.” markings, but would have been essential items for the soldiers. Underneath the saddle, saddle blankets were used to protect the horse’s coat from constant rubbing. These blankets were usually made out of wool and sometimes would have the Cavalry unit’s designations on them. A “shabraque, ” a cover designed to go over the saddle, is a rare accessory and were not in common use by the U.S. Cavalry. Gen. Robert E. Lee was presented a shabraque during the Civil War by the ladies of Richmond, Va. Lee, being a gracious man, accepted the gift, but used it only one time in his career, at a military review. Behind the saddle, a valise would be attached for carrying provisions. The “Grimsley leather horseshoe pouch, ” carrying a spare horseshoe and nails, was the “emergency roadside kit” of the day. Cavalry accoutrements provide a range of material for everyone – from the novice to the sophisticated collector. For the beginning collector interested in American military history, they can be a unique and affordable niche on which to focus; having a goal of constructing a complete “rig” can be a fun lifelong pursuit.